Hola MExican Film Festival, Sydney. I awaited the opening of the Mexican Film festival with bated breath. Many of us were stood in line, our yellow wrist bands signified us as espanol supporters. We shifted from foot to foot awaiting entry into Mariachi Gringo in Cinema 9. I do not speak Spanish, amigos. Upon walking into the cinema we were greeted by a spotlit Mexican gentleman strumming a harp-looking instrument with calm harmonies, talented fingers and slow Spanish serenading. I’ve not a clue what this traditional Mariachi was singing, but I felt it was deeply romantic, a love song just for me. He greeted us with something in Spanish, Buenos Noches, I think, then told us he had a lot of Mexican feelings, of pride and the like. He then proceeded to entertain us with a traditional version of La Bamba. He then sung a song called The King and the Spanish ladies in the audience echoed back and the men shouted ‘Arriba, Arriba!’ Behind him, flashed advertisements for SBS and Mexican tequila and restaruants. Yes, I am being successfully wooed into the South-American community and their welcoming arms and warm and spiced. 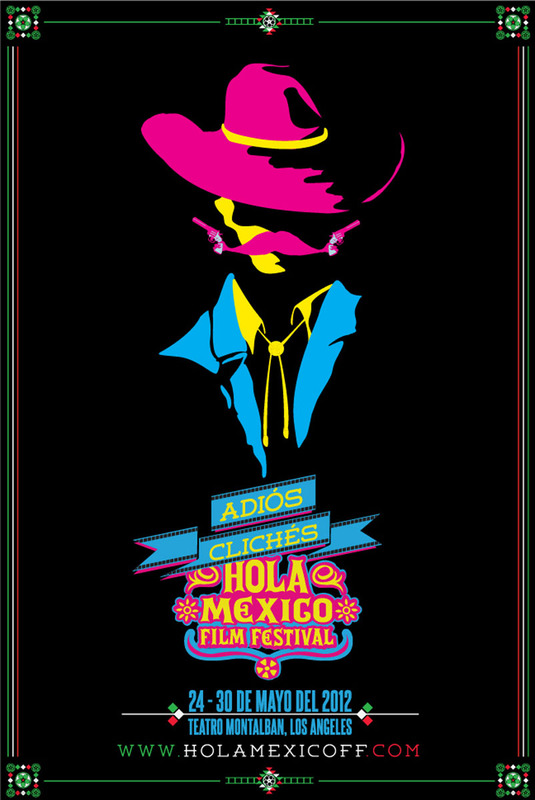 The Mexican film festival is running for the 7th consecutive year and is sporting the slogan ‘Adios CLiches; Hola Mexico!’ as it endeavours to promote all Mexican voices and perspectives, in an attempt to dub out clichés and stereotypes. Live Mariachi bands, traditional music and a stellar film line-up, this festival promises only the best in entertainment. The film itself, Mariachi Gringo, was very rich in life, emotion and reality and it showed a Mexican culture I was not familiar with seeing commercially. I absolutely recommend this experience for everyone, of any age or agenda. The festival isn’t on for long, so make the most of it while you can. Although the films shown change every day, I guarantee your experience will be just as beneficial as mine, as you either view a distant culture with different lenses, or embrace your familiar home with welcoming arms. For more information, please visit: http://www.holamexicoff.com/ for times, venues, pricings and films. My trip to the Red Centre must end, but my long, transitive and spiritual moment will never. Sunrise this morning saw the arrival of a full, rich, golden disc. Saffron perhaps? The colour of a peach’s flesh? The surrounding clouds shifted from a dusty pink and lilac to a brilliant peachy orange. Kata Tjuta emerged from the horizon with the back forms catching the light so that the foreground forms remained in a silhouette. I turned and a few moments later, the light had changed, ever so slightly, to the foregrounded rocks taking a deep burgundy colour against their clouded, black sisters in the background. Uluru itself is picturesque. As the cloud cover gently peels back, streams of sunlight enlace the now blue sky. People doing the climb are no bigger than ants on the rock and this gives me a sense of contentment that I chose against climbing. The rock, an ancient testament to spirituality and time carries significance and grandeur that does not need to be conquered by foot. The rock stands solitary and seems to reveal no emotion, one cannot personify it. It just seems to rise above man’s need to dominate. It’s peaceful. It’s calm. The Kapi Mutitjulu waterhole at the base of Uluru is neither calm nor tranquil. Rather it goes with a legegnd of strength and resilience. I feel a strong presence of power. This place has power, the water has power, the wind and people have power. 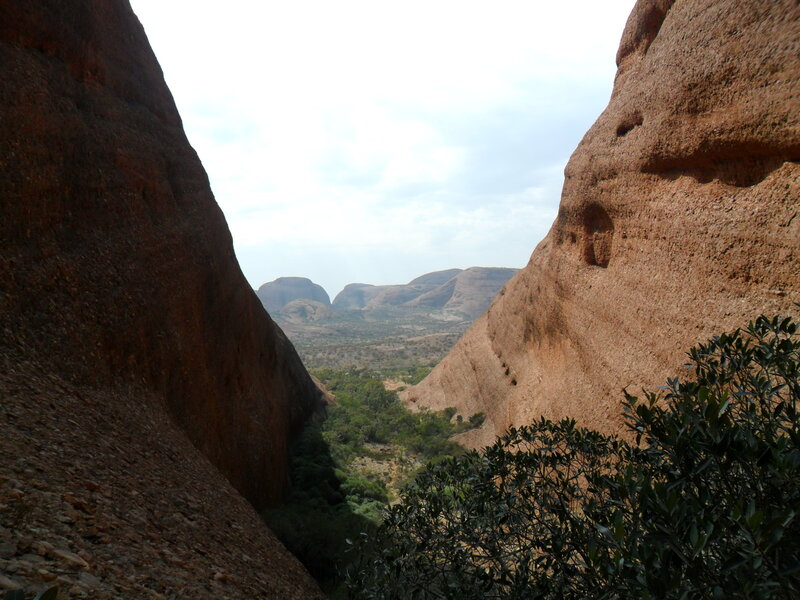 Today we walked 7.4kms through the Olgas. The track is long and arduous, but the views are astounding. Towering on all sides are these gentle monsters of conglomerate rocks, sitting placidly and gracefully. Their presence is wholesome and full and yet they loom with no danger. They humble and instil an eerie sense of humility, they do not belittle. The rocks, they are so hard and so steep and yet there is green in their crevices. Swallows nest and finches live and there is life in this sacred site and the Valley of the Winds breathes freedom. Sunset from our campsite overlooked Kata Tjuta and Uluru. A glowing golden sunset silhouettes the Olgas and frames Uluru. The haze of rain and dusty wind creates the perfect mist, capturing elemental magic. The sky is still powder blue, the sunset a wildflower golden. 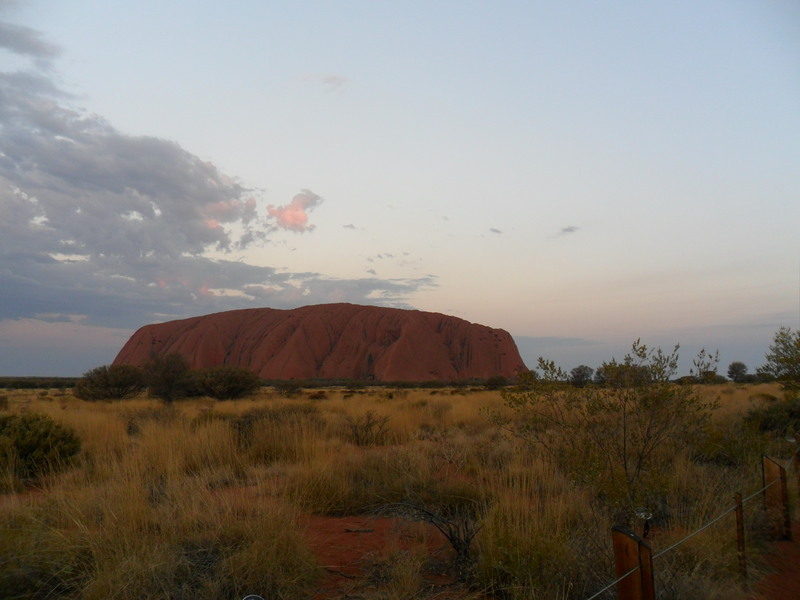 The horizon is a gust of red dust, so that Kata Tjuta and Uluru emerge as shapeless giants. Lightening strikes. We had dinner at the Outback Pioneer Hotel and I had the Outback Combo- Emu, Buffalo and Beef sausages with Crocodile and Kangaroo skewers. The coat of arms, regrettably, tasted quite good. Over dinner, I was asked; “What have you taken away from this trip, hmm?” to which I thought to myself for a few moments. I finally answered with the idea that is is impossible for anyone to capture the true nature and beauty of the outback landscape with any visual or literary medium. Dorothea McKellar is very close when she claims; “I love a sunburnt country, a land of sweeping plains, of rugged mountain ranges, of drought and flooding rains…” It isn’t until you immerse in the red dust that you fully appreciate these four lines. The Olgas from Lookout Two. Showing from October the 11th until the 25th of November at the Belvoir is a modern adaptation of the ancient Greek play by Euripides; Medea. With fantastic acting, this performance captivated audiences on a rollercoaster of tension, humour and family angst. The story of Medea sees her unstable marriage with husband Jason (of the story Jason and the Argonauts) and to spite him and watch him suffer, she resorts to killing his mistress and his children. This legend of a mother’s angst and her actions when she is at wit’s end are interestingly not the focus of this performance. Medea instead focuses on the children, before they are victims of the family politics and the playwright’s ability of capture the antics of little boys is possibly unrivalled. Their boisterous attitudes and childlike insight are not only a product of the skilful script, but also the extreme maturity of the actors. Absolute commendation to the actors. Blazey’s performance of Medea herself is superb, she commands the attention of the room in a matter of minutes, by stringing out the tension through well-placed silences and posture, it’s so very powerful. The lighting, use of darkness, glow in the dark stars and the set design were very well thought out and believable; these characters may have even been lifted straight out of our own lives. On a niggling reservation, I felt that I needed more of a back story, more of an understanding of why Medea resorted to such a ‘brain-snap’ to kill her children. Without prior knowledge of the Greek play I feel as though sympathy for Medea was difficult to generate as we didn’t comprehend why she hated her husband so much. That said however, they play was focused on the children and the children were convincing and their deaths very powerful. Puccini’s Madama Butterfly is now playing at the Sydney Opera House and to miss this would be more than an irreversible regret. The costuming was detailed in silk creating a sense of sensuous voluptuousness. Visually, this opera was spectacular, easily the most stunning show I have ever had the privilege to watch. Subtle breezes over the stage sent white curtains billowing, the water moat around the raised stage was used to float tea-light candles. Somehow, the opera crew created a sacred and stunning space, something so breath-taking that ladies in the row in front of me were actually in tears at the performance. But it’s not just the staging that can evoke the use of a tissue, it’s the whole atmosphere. When the lights are dimmed, they reveal the pinpricks of a starry night, and a perfect moon overlooking one of the most romantic and tragic love stories of all time. The entire show was like witnessing a picturesque Japanese post card and the lighting was totally flawless. I was seated where surtitles could not be seen, but this was not an issue. 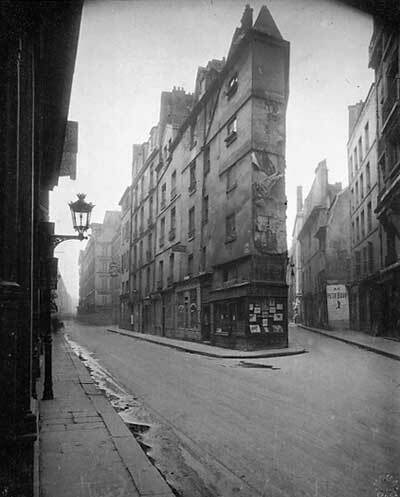 At one point, a letter of bad news is read out. Butterfly’s face lights up with energy, passion and excitement and the stage is awash in pink. Later, the same letter reads a great tragedy for Butterfly- her beloved American soldier has since married in the US. Her face darkens, as the lighting changes dramatically to deep blues and greens and I felt a heart-breaking pain; I had invested so much emotional energy in Madama Butterfly. 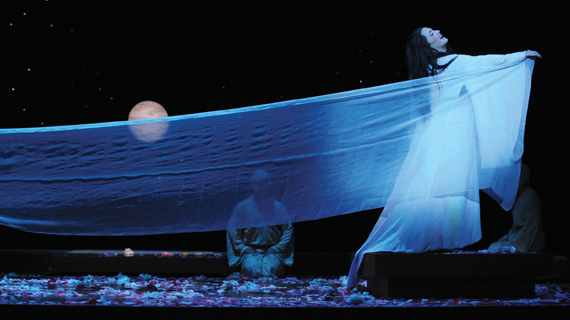 Puccini’s opera is recognisable, hum-able and so very poignant. Commendation to the actor who played Madama Butterfly’s son- he was so perfect and gut wrenching in his silent performance of love for his mother. As we watch Butterfly await the return of Pinkerton that will never happen, we watch her suspense, her loving devotion and adoration. She smiles, but there are tears in her eyes. Her dedication to the dream that is Pinkerton is manic, borderline lunacy and we feel so much sympathy for this Japanese woman wronged by a marriage of convenience. We had invested so much in Butterfly’s story that when Pinkerton came to bow onstage in the finale, the audience in fact boo-ed him off, (all in jest of course). The show has a sad nostalgia, a tragic loss of a romantic ideal, a sensual and perfect night of Opera. I cannot regard this performance more highly. Performance dates: 20th September until the 1st of November.